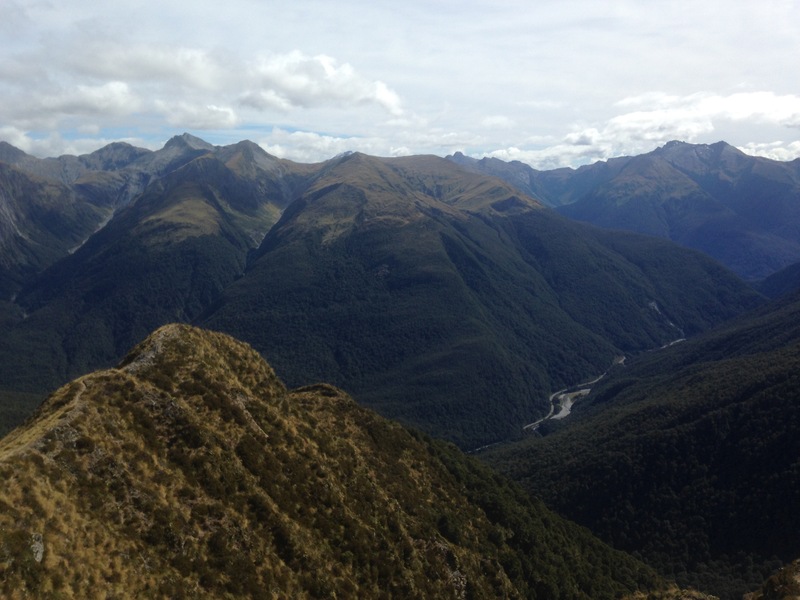 After a few weeks off, this weekend we thought we’d get back on the trail and hike to Brewster Hut – somewhere between Haast and Makarora in Westland. What the hike lacks in distance, it makes up for in elevation. 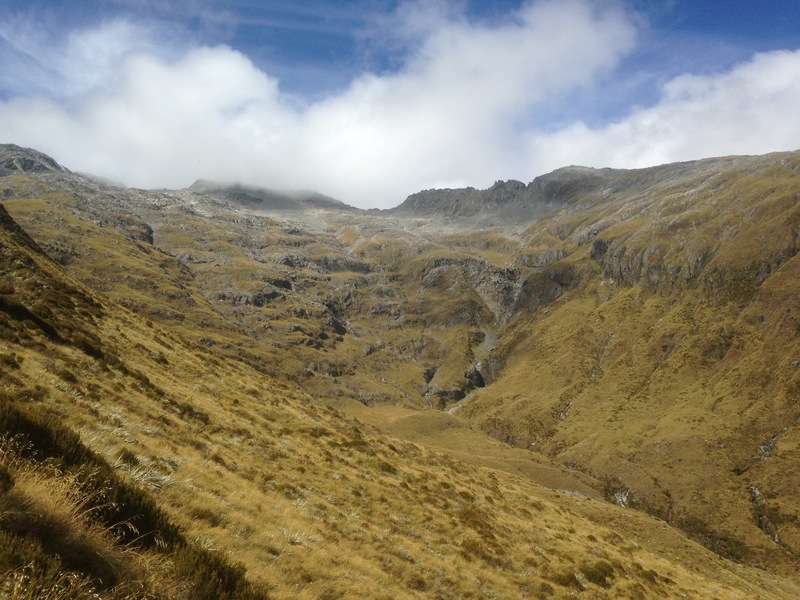 The 2.5km walk from the car park, through a river, dense woodland and along narrow ridges to the hut involves a steep ascent to an altitude of 1400 metres. 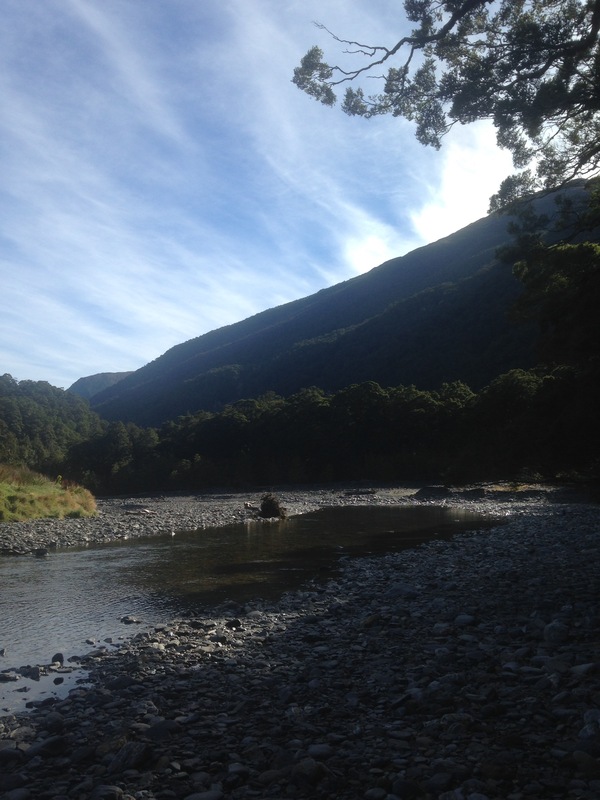 We set off from the car park at the bottom of the valley and were immediately confronted by a shallow, gentler river. After my previous attempt at wading across a river, we take extra care crossing this one. Relieved not to have embarrassed myself or terrified Steph this time, we reach the other side, where our relief instantly turns to dread as we see the vertical bank that faces us and extends up in front of us into the vague distance above our heads. 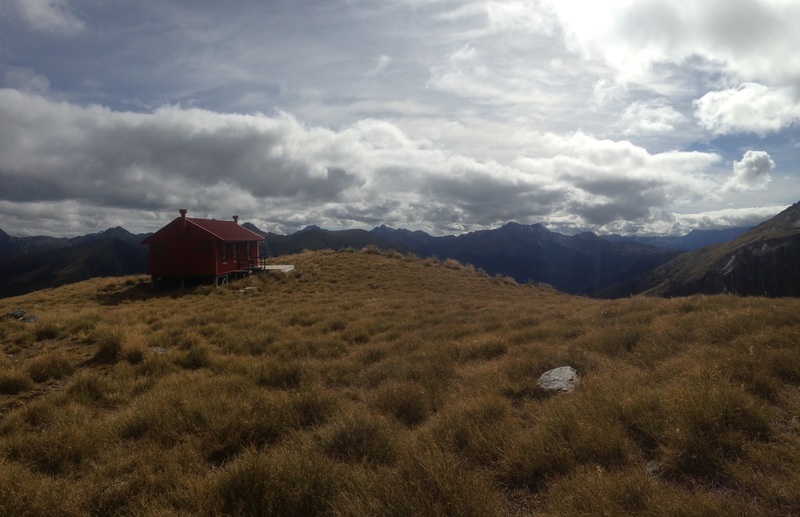 This is our route up the mountain to Brewster Hut, which has been on our to do list for months. Its should take us three hours. Not much really. Easy even. We’ve done much longer walks in terms of both time and distance. It’s steep, yeah, but we’ll manage it alright. 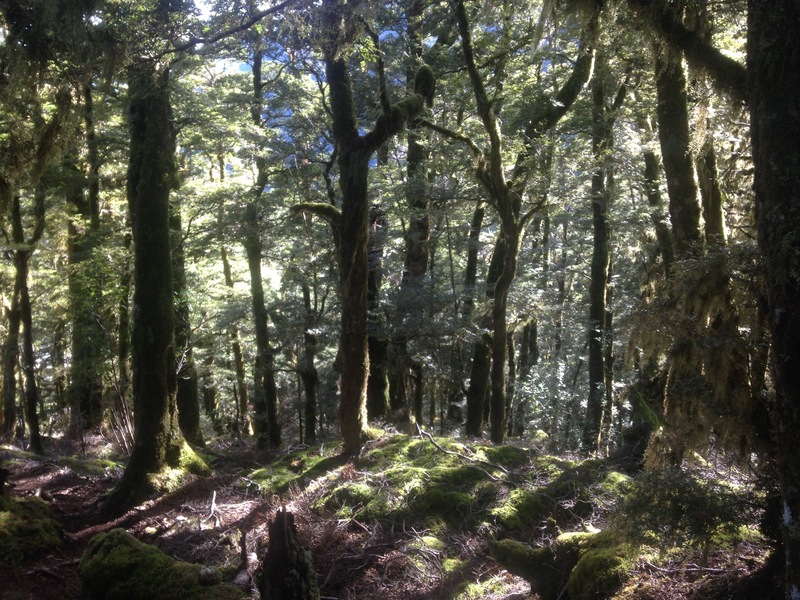 Tangled roots provide steps and handrails that are equal parts help and hindrance as we traipse along the path, through the heart of this typically magical New Zealand beech forest. As we trudge on, higher and higher, the magic morphs into mundanity. After an hour in the woods, the hut feels increasingly like a mirage. We meet two walkers coming back down who tell us “There are a couple of flat bits coming up. Savour then”. Oh great. We continue, encouraged by the promise of more level ground. Flat is a bit of a stretch, but the lessening strain is welcomed. Eventually we make it to the top of the bush line, out onto the open moorland and the ridgeway to the hut. Steph is delighted by the change of scene, escaping from the tedious repetition of the woodland scenery as stunning views of the valleys below open up on either side of us. I however curse the narrow path, the lack of shade and the sabre toothed undulation of the ridge. I wish it was over. I’m getting hot and angry and tired. Then, just as I am reaching the end of my tether, we see the beige corrugated iron of the hut toilet and all was well in the world. Rarely has a toilet brought such joy to our lives. 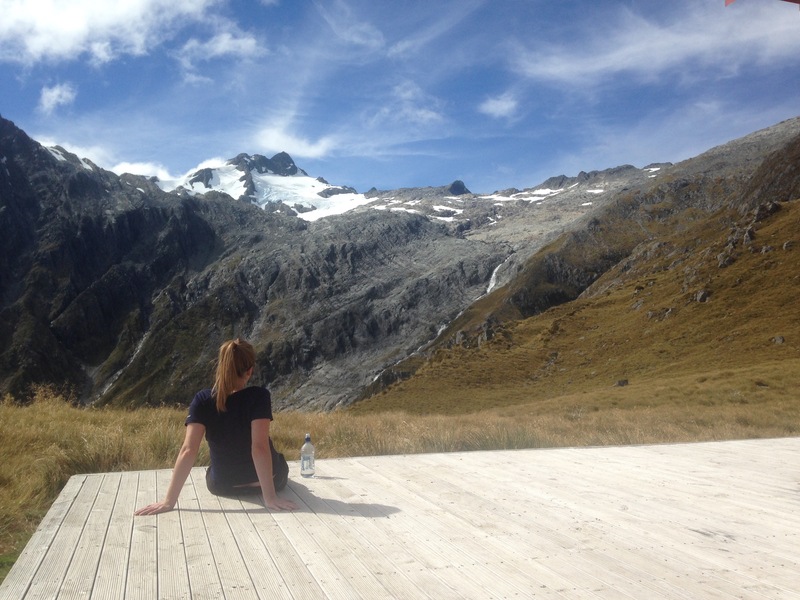 We get to the hut, claim a bunk, and then unwind on the deck, soaking up the sun, the view and chat to our fellow trampers. We look up to Mount Armstrong ahead. Cloud has blown in and it’s not worth the two hour hike to the summit this evening. We’ll do that in the morning. 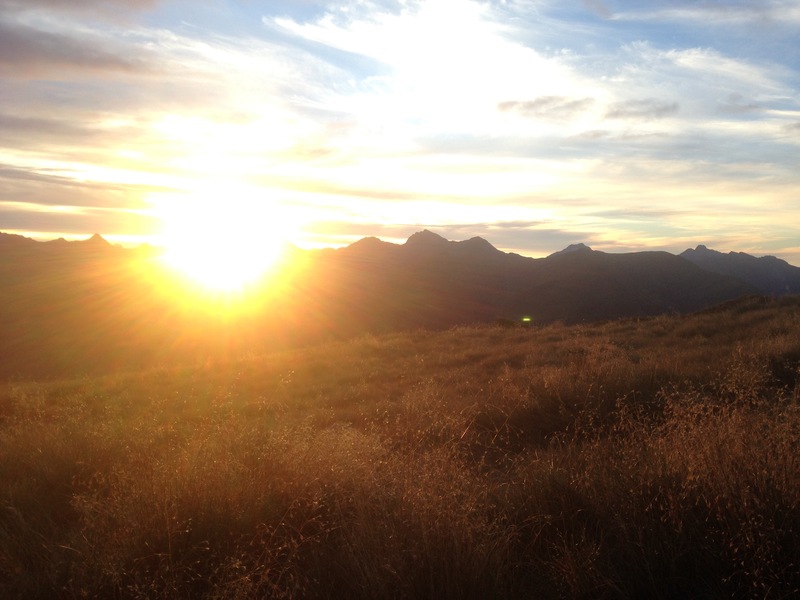 Hours, conversations, food and drink pass and before long we’re all out watching the sunset over the mountains behind us and gazing at the stars and Milky Way above. The next morning the sky is cloudless and we make the trip to the summit of Mount Armstrong (2174 metres) in two short hours. We do our best to follow the litany of cairns to the top, improvising our own path where necessary, climbing over up gullies and over skree on the way. This stage of the hike is beautiful. 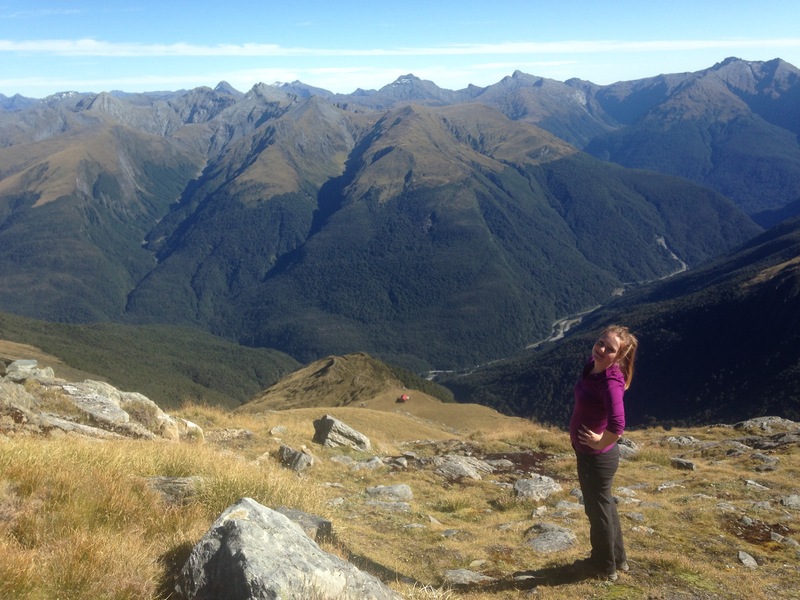 Great weather, wonderful views of mountains, glaciers and rivers, and a perfectly manageable gradient. Bliss. 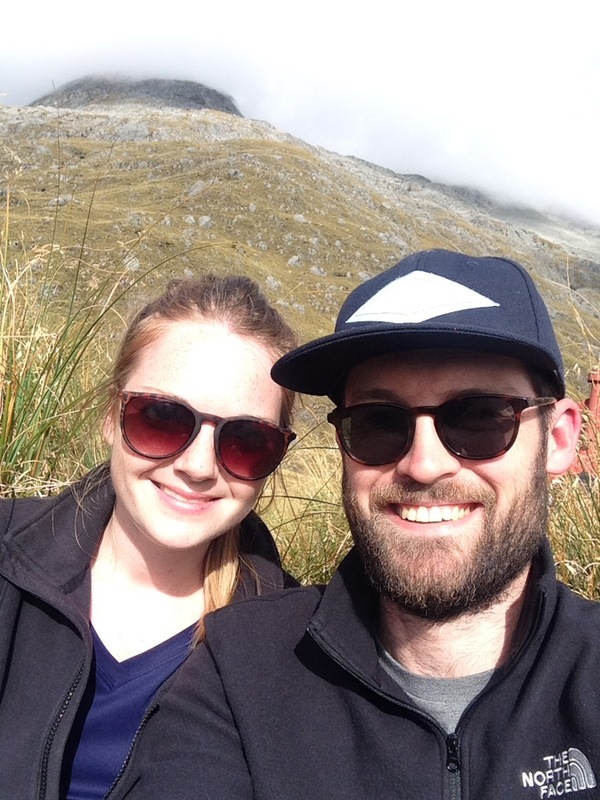 From the summit we can see out to the ocean to the west – or at least where we know the ocean is, it’s covered in cloud – and into the heart of the country, towards Mount Cook to the east. The is no wind, no noise, just glorious peace and unbridled natural beauty. It’s the first time we’ve reached a summit and not been cloaked in cloud. It’s easy to see why people get to the top of Everest and other big mountains and spend too long up there. The tranquillity is mesmerising, the rest after the effort of getting there is addictive and the sense of self satisfaction is warming. Not that our two hour trip is anything akin to conquering Everest! But it’s easy to extrapolate. Soon we head down, knowing we have at least another five hours ahead of us, most of which will be back down the nerve wracking ridge and through the forsaken forest. This time it’s even worse, trying not to fall to certain injury over the roots as we try if fight our bodies’ urges to succumb to gravity and the slippery earth beneath our feet. We take tentative steps, slide on our arses, us trees to break us, roots as ropes to abseil larger drops in the level of the path over the longest three hours of our lives. 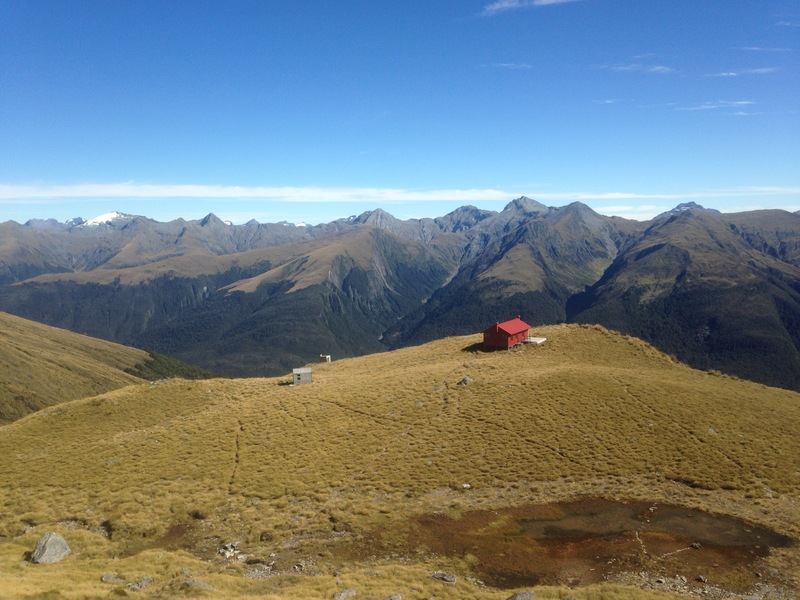 It’s a good job the weather was so good and the views so special because if this weekend had been little more than walking up and down this rancid heap of a hill I’d have forever rued the day we ever heard about the Brewster Hut. This is not a hike for fair weather walkers. It’s hardly a hike for regular tampers. If you can, get a helicopter to the hut, you’ll enjoy it a lot more and won’t hate the fact you exist for 50% of the trip. Thanks to the physical and mental hardship we at least felt like we had earned the beer and burger we got from Red Star when we got home. One large, delicious crumb of comfort after an exhausting, but mostly enjoyable, weekend.